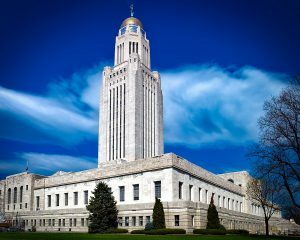 Are you thinking about moving to Nebraska? 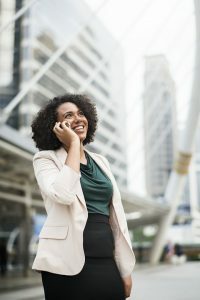 Whether you are relocating your business our household, we can help. Best Cross Country Movers Nebraska are experts in long distance moving of any kind. Our experienced and reliable interstate movers can pack, move and store your belongings for you. So-called flyover state of Nebraska has much more to offer than you can imagine. Compared to other states, the air in Nebraska is much cleaner. And when you get out of town, it smells even better, especially in the summer months. Saying that everybody knows everybody in a small town sounds like a cliché. But this is really true when we talk about small towns in Nebraska. Furthermore, people are much closer than in big cities. In Grand Island and other semi-rural communities, farmers’ markets here are the real deal. Farmers load the day’s harvest into the back of their pickup trucks, drive into town and drop them to market. For the ones that prefer a healthy diet, Nebraska will be a paradise. Also, this part of the country has the probably best sweet corn and watermelons money can buy. 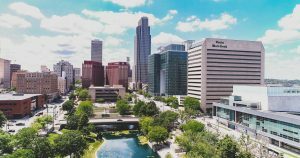 One of the most attractive cities of Nebraska- Omaha. The cornfields and plains of Nebraska are gorgeous in their own quiet way. Especially when the sun is rising or setting, you can really enjoy the landscape. Also, there’s not much light pollution in this state. Therefore, on a clear night, you can see thousands of stars. Tourists from all over the world visit Nebraska’s museums, such as Fort Robinson Museum or Stuhr Museum of the Prairie Pioneer. And although this state may not seem glamorous or exciting as other places at first glance, it’s brimming with history and culture that shouldn’t be overlooked. Interstate movers offer high-quality residential moving. We will move your household, so you don’t have to. If you want efficient business relocation with minimal business interruption, call us. Best Cross Country movers Nebraska are experts in long distance commercial moving. If you need a place to store your belongings long or short term, we can help with that too. Our premium storage services are at your disposal. If you don’t want to lose time and money purchasing packing supplies, leave it to the professionals. Interstate movers will provide you with full packing services. 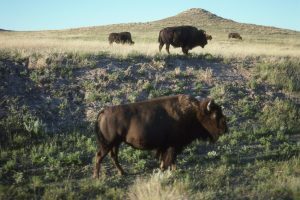 American bison in the Fort Robinson Museum. Our mission is to provide customers with a stress-free cross-country moving experience. Interstate movers achieve this through detailed planning and organization. Also, we are completely devoted to the expert moving and storage services we provide. No relocation challenge is too complicated or difficult for our team of experienced moving experts. Best Cross Country Movers Nebraska offer you high-quality packing, moving and storage service for your home or business. We can help you with moving in a week, day or month. Long or short notice, we are equally efficient. We are passionate about what we do, and therefore, we are good at it. Contact us and get your free moving quote today. For an experienced and budget-friendly move to Nebraska, get in touch with our cross country movers Nebraska. With premium services usually come sky-high prices – or so people say. In reality, you don’t have to spend a fortune to ensure one of the best interstate moving companies Nebraska stands by your side on your moving day. All you have to do is get in touch with Best Cross Country Movers and all of your moving problems will be a thing of the past. Whether moving to Nebraska or one of 50 US states, consider us your allies! Plenty of people wish to avoid the hassle one relocation brings – be it a local relocation we are talking about or a long distance one. Furthermore, whether in the middle of a residential relocation or a commercial one, you will most likely need a team that will cater to your needs from start to finish. Such cross country movers in Nebraska are hard to come by. But not if you hire Best Cross Country Movers for the job! From the moment you first contact our friendly dispatcher, you can rest assured you will get the appropriate help. We will provide you with a moving quote for your upcoming relocation, and we will make it an accurate one. Transparency is our signature move, which means that there will be no hidden charges to worry about. The price you see is the price you get – no doubt about it! With our interstate movers Nebraska, you get a fine deal! Experience and competence mix in order to create Best Cross Country Movers – a company set on providing you with the finest moving services! Our experience enables us to create a perfect moving plan for your relocation, pack your items and secure them for transport, and bring your relocation to fruition. Worry not about anything going wrong. If a problem does present itself, we will know the best way of handling it! One phone call stands between you and top-notch interstate Nebraska movers. For one of the most reputable interstate moving companies Nebraska, give us a call! Once you get in touch with Best Cross Country Movers, you can slowly let all of your worries leave your body. Tension and strained nerves are not allowed when you have our cross country movers Nebraska on your team. Let us take care of your house or your business and enjoy while others do all the hard work!